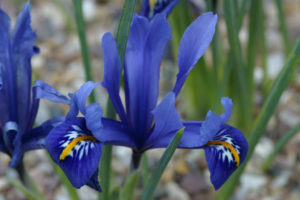 Iris reticulata is a splendid early flowering bulb. The flowers only last a week or two, but they are well worth growing. They never fail to add a splash of colour to the Alpine display house and around parts of the Alpine yard. In the wild, they are found growing in scrub and rocky meadows and, for that reason, there is often a misconception that they require a summer bake and should be left to dry out when grown in pots. However, the bulbs require some moisture, even when they are not in growth. Failure to do so will result in the bulbs drying up or dying. In an open garden, they like a sunny spot which is well drained but need regular moisture.